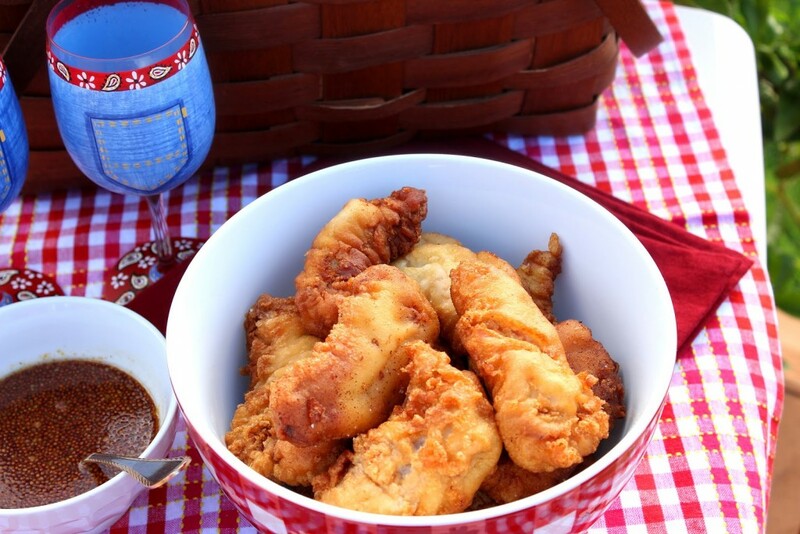 Chicken and waffles get a picnic-ready upgrade with this recipe for Waffle Batter Fried Chicken Tenders with Maple Mustard Dipping Sauce! Now you can pack up this classic treat, up and easily take it wherever you want to go. In my mind, you can’t go on a picnic without fried chicken. It’s un-American! And with the 4th of July looming just a few mere days away, I’ve whipped up this amazing Waffle Batter Fried Chicken Tenders with Maple Mustard Dipping Sauce, because why not put it over the edge of awesome-sauciness! I know, I know, that’s not a real word but somehow it just seems to fit! LOL Happy #SundaySupper everybody! Let’s go on a PICNIC! 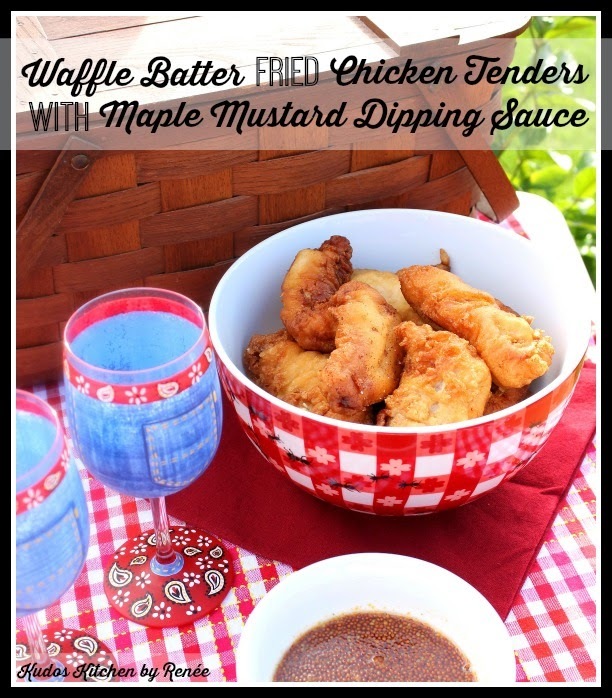 **Please Note – The printable recipe card with detailed instructions and complete ingredient measurements for making Waffle Batter Fried Chicken Tenders with Maple Mustard Dipping Sauce is available near the end of this post. Chicken and waffles have been on my list of things to make for a long, long time but somehow they just kept getting pushed back to the end of the long list of things I’ve wanted to cook and share with you. Then, a few weeks ago while we were out to dinner with my sister and her husband, the subject of chicken and waffles came up (go figure that we’d be discussing food, haha) and my brother-in-law mentioned that Popeye’s Chicken has a new waffle batter chicken commercial he’d seen on TV. Right then and there, I knew what I needed to make. Pronto! No more pussyfooting around. We’ve got chicken to fry!! This is my original recipe (sounds a little like KFC, don’t you think?) which was inspired by the idea of Popeye’s waffle batter chicken. I’ve never had, Popeye’s chicken, and now I won’t need to, because I think my Kudos Kitchen Waffle Batter Fried Chicken Tenders with Maple Mustard Dipping Sauce probably blows Popeye’s chicken right out of the water! Place the chicken tenders in a ziptop bag along with pure maple syrup and balsamic vinegar. Set aside to marinate for 30-40 minutes. Meanwhile stir together the flour, sugar, baking powder, salt, and pepper. In a small bowl, whisk the milk, eggs, melted butter, and maple syrup. Add the wet ingredients to the dry ingredients and whisk until blended. Remove the chicken tenders from the marinade and dry them with paper towels. Dip the marinated chicken tenders into the waffle batter allowing the excess to drip off before frying them in hot oil (325-350 degrees). Carefully fry the tenders on both sides until golden brown (approximately 8-10 minutes) and the chicken is no longer pink in the middle. Carefully remove the chicken tenders from the hot oil using a large slotted spoon and place on a rack to drain. Season lightly with additional salt, if desired. Continue the same process with the remaining chicken tenders. To make the dipping sauce stir the maple syrup, mustard and honey together in a small bowl. Serve the tenders with the sauce. Enjoy cold or hot! One more thing before we get to the actual recipe. I made my own waffle batter from scratch, but feel free to use your favorite variety of boxed waffle mix (I won’t tell). However, when you do make the Waffle Batter Fried Chicken Tenders using a boxed waffle batter, make sure to add the maple syrup into the batter along and the melted butter. You won’t be sorry! All the flavors you love from a traditional chicken and waffles recipe, but in an easily transportable package. 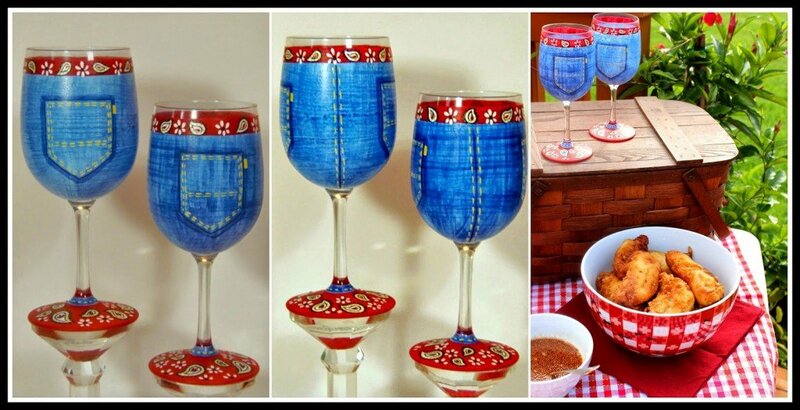 Perfect for parties or picnics. Place the chicken tenders, maple syrup, and balsamic vinegar in the zip-top bag. Massage the bag to coat all the chicken. Allow the tenders to marinate at least 30 minutes, but no longer than 1 hour. After the chicken has marinated, dry the tenders on paper towels. Discard the remaining marinade. In a large bowl, whisk together the flour, sugar, salt, pepper, and baking powder. In a small bowl, whisk together the melted butter, eggs, milk, maple syrup. Add the wet ingredients to the dry ingredients and whisk until combined. Allow the waffle batter to sit for 10 minutes before coating the tenders. In a large, high-sided pan, bring the oil up to a temperature of 325-350 degrees. *Note - if you dip the handle of a wooden spoon into the oil and small bubbles happen around the base of the spoon (think champagne bubbles), the oil is ready for frying. Dip the chicken tenders into the waffle batter and allow some to drip off before carefully adding the waffle coated tenders to the hot oil. Fry the tenders on both sides until golden brown (approximately 8-10 minutes) and the center is no longer pink. Carefully remove the fried tenders from the oil using a large slotted spoon. Drain the fried tenders on paper towels and season immediately with additional salt, if desired. Continue the same process with the remaining chicken tenders. Combine all the sauce ingredients in a small bowl and serve with the waffle batter fried chicken tenders. Serve hot or cold. Note - If using boxed waffle mix, I still suggest adding the maple syrup and melted butter to the batter for extra flavor. large high sided pan (for frying), large slotted spoon, large bowl, medium bowl, small bowl, measuring cups, measuring spoons, gallon zip-top bag, cooking thermometer (for heating oil), paper towels, baking sheets (optional). 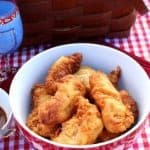 I hope you’ve enjoyed this recipe for Waffle Batter Fried Chicken Tenders with Maple Mustard Dipping Sauce as much as I’ve enjoyed bringing it to you!! Before we go any further with our virtual #SundaySupper picnic, I’d like to take a moment to thank our hostess for this week Jane, of Jane’s Adventures in Dinner, and as always the “behind the scenes” hard working bees that keep us all organized and in line…Heather of Girlichef and of course Renee of Magnolia Days. Thanks, ladies. Guess it just goes to show that sometimes too many cooks in the kitchen can be a very, very good thing! And now, let’s open that picnic basket a little further and see what the other #SundaySupper members brought to our virtual picnic…I hope you’re hungry! Should you have any questions regarding this recipe for Waffle Batter Fried Chicken Tenders with Maple Mustard Dipping Sauce, or anything else you’ve seen on my site, please don’t hesitate to contact me directly, or leave me a comment in the comment section below. It is always my distinct pleasure to get back to you with a reply just as soon as I possibly can! Wow, the coating on your chicken tenders is incredible! These would certainly disappear quickly off the picnic table! Oh my!!! Look at that glorious batter! This chicken looks so crisp! I am sure it would be very hard to resit it! These sound so flippin' fantastic, Renee! I guess I even missed the commercials but what a great way to have that southern favorite of waffles and fried chicken all in one great bite, Reneé! This batter would be a huge hit at our table!! I love this idea Renee. They sounds soooooo good!! This is a GENIUS idea. I love chicken and waffles and using it as a batter is a great move! Can't wait to try this! Yikes! Don't compare your dish to Popeye's Chicken. Yours is much better. I love your twist on Chicken and Waffles. I especially like that you did this with chicken tenders! Looks fantastic! 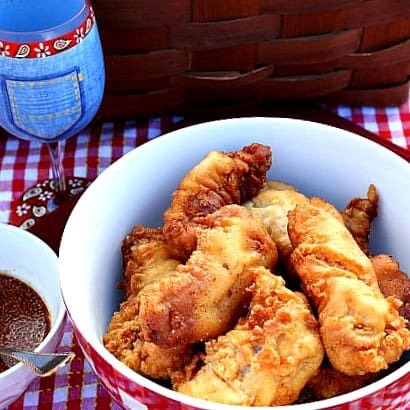 You can't go on a picnic without Fried Chicken! 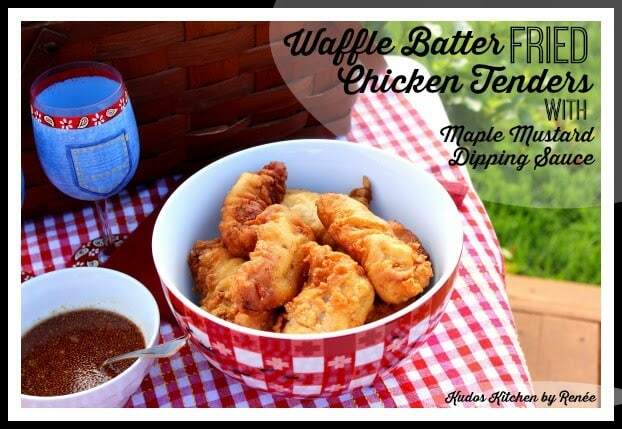 Love how adapted this with the chicken tenders and coated it in waffle batter. Whoa!! Waffle batter? This is a great idea! Oh my goodness, I think I died and went to heaven! Awesome, chicken and waffles all in one! I love fried chicken. I love chicken and waffles and well this, well this is just incredible! I'm in love with everything about this recipe. Waffle batter and putting maple syrup into mustard. Looks delish! Way to take chicken & waffles to the next level! The waffle batter coating is pure genius. This is awesomeness on a plate! Wow! Great idea with the batter! Oh my goodness are these for real???? Amazing! Oh YUM! These look incredible!! What a fantastically funky and yummy sounding batter! Fantastic looking chicken. I need to try this next time I make fried chicken tenders. And I love honey mustard sauce…but then you took that to a whole new level with the maple….WOW!!! Perfect batter dipped chicken! Let's picnic! The waffle battered fried chicken looks great and having marinated the chicken in your maple and mustard sauce must have made it all the more scrumptious. Great original recipe (s) Renee. This may turn into a family favorite. What a great idea and I have a really good gluten free waffle mix I can try for me. Thanks for the recipe. I have heard so much about waffles and fried chicken but have never seen it served let alone tried it. Maybe one day I will get to that but until than this looks like a fun way to have it.